A theatre director attempts to save his marriage while on a retreat in the South of France. One of the reasons that I love writing for The Movie Waffler is the arcane nature of the films that we cover; oddities, obscurities, off-the-beaten track and out-of-the-way flicks that get very little exposure otherwise. It’s like being privy to a cinema of secrets, where, although some films may well be utter rubbish, the niche nature of our remit makes each submission different and, due to their mystery, potentially thrilling: who knows what overlooked classic could be uncovered next? As a character in this week’s introspective A Change in the Weather remarks, ‘the search is everything’. Funded by the British Film Council, Jon Sanders and Anna Mottram’s film is perhaps destined for a platform beyond this humble appraisal, but in all other respects it is exactly the sort of film The Movie Waffler should be covering: esoteric, unique and, yes, slightly pretentious. But is it, you know, any good? We open with an attractive woman of a certain age (Lydia - Mottram), shot in static medium against a stark background. To unseen voices off camera, she recounts aspects of her marriage in that flat and objective manner that suggests that, rather than lasting passion, it is simply time that binds the long-term relationship. In her monologue, Lydia professes that she is a ‘natural collaborator’, and it transpires that she is the wife of theatre director Dan (Bob Goody!). Dan is suffering a late-life crisis, and has swept his partner and other assorted thesps along to a very picturesque area of Southern France in the hope of refreshed creative collaboration and the revival of his marriage. His approach to achieving both goals involves the company, including Lydia, re-enacting several scenes from his troubled relationship, even as the process causes the marriage further strain: meta! The staginess of the opening sequence, and following tableaus, are interspersed with more naturalistic scenes, mainly of Lydia and Dan discussing the work, their relationship or engaging in the sort of phatic communication that makes these scenes distinctly, almost uncomfortably, intimate. Whether they’re discussing the tedious minutia of hot seating or sipping a nice Bordeaux, these scenes have an improvisatory aura, which make them all the more compelling. As if to stress the point, early on such a conversation takes place in the bathroom, with Dan, in all his aged and naked glory, sitting in the tub. Metaphor alert! : this is going to be a raw, naked examination of a relationship in turmoil. When the film is mining this aspect of its thematic foundation it provides riveting drama. Young people getting married/splitting up: big deal. A decades long commitment, requiring adaptation and understanding, is a far more impressive testament to love. And what of the couples who stay together out of fear of the unknown or simply habit? A Change in the Weather’s portrayal of Lydia breaking away from such a fate, and Dan’s subsequent confusion and heartache, is both unflinching and entrancing. The problem is that, at nearly two hours, the indulgence of other sequences - sweeping shots of imposing greenery, weird rehearsal arrangements involving an extended dance with a spooky mannequin, luvvie banter - are at odds with the emotional veracity of the core drama. Such non-causal scenes could probably have been cut back a little to centralise the honesty of the central drama. The extension of the film’s strange ambiance takes in pseudo-dream sequences, wherein Lydia imagines a long dead friend has come back to life to offer her advice, and the visitation of the couple’s grown up child played by Goody’s real-life daughter Seonaid, adding to the film’s narrative authenticity. 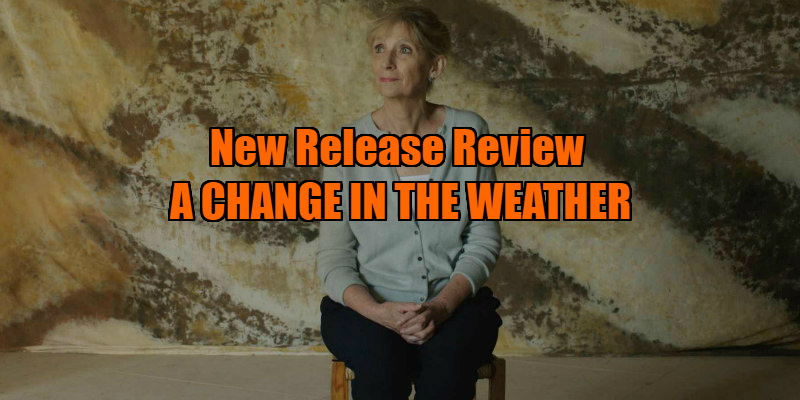 A Change in the Weather is a niche pleasure, and its commitment to its fragile, contemplative mise-en-scene is invigorating. But to paraphrase Lydia (and, by extension, the film’s co-writer) in her opening monologue, is it always interesting? The abstract nature of the narrative may well cloud A Change in the Weather’s effect; however, when the light does manage to break through the murk, the film shines. 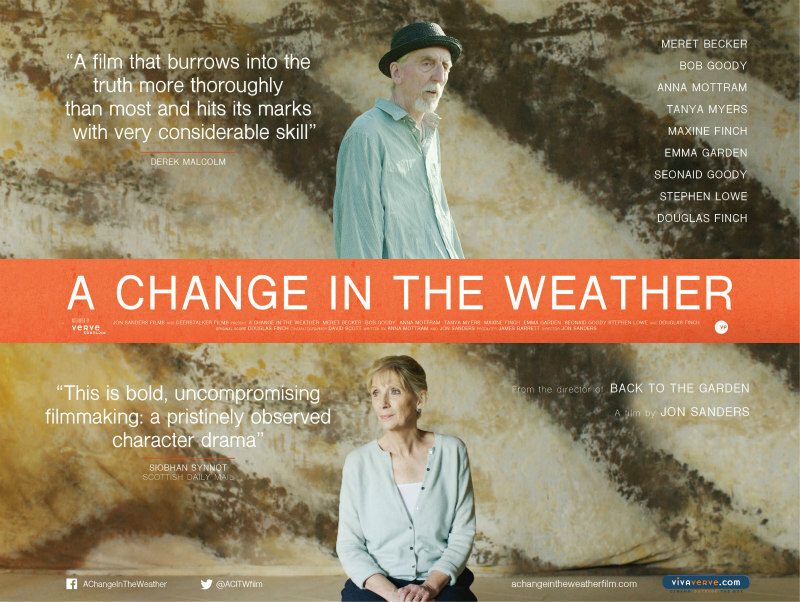 A Change in the Weather is in UK cinemas July 7th.